Not everybody with connections to the Olympic Games was an athlete who competed in the Olympics. Here are a number of famous people, in various fields, who had Olympic connections often not well known. Sissel – the Norwegian classical cross-over soprano with the Angelic pipes was well-known in Norway since she was a young teenager. But it was her appearance singing the Olympic Hymn at the Opening and Closing Ceremony of the 1994 Lillehammer Winter Olympics that helped her become known to an international audience. Gordon Lightfoot – Canada’s best known folk singer was past his popular prime in 1988 but was still chosen to sing at the Opening Ceremony of the Calgary Winter Olympics, performing one of his old standards, “Alberta Bound,” as the world’s athletes came to Alberta. Placido Domingo – Placido Domingo, the well-known Spanish tenor, performed at the Closing Ceremony of two Olympic Games. In 1992 at Barcelona, Domingo sang the Olympic Hymn. In 2008 at Beijing, Domingo performed a duet with Song Zuying, singing The Flame of Love. Oddjob – In the very popular James Bond movie, “Goldfinger,” the villain was Auric Goldfinger, who was trying to take over the world’s gold supply. Goldfinger’s lead henchman and enforcer was a stocky Oriental-appearing muscleman named Oddjob. Oddjob was played by Harold Sakata, a Hawaiian-American of Japanese ethnicity, who won a silver medal in weightlifting at the 1948 Olympics for the United States. José Carreras – At the 1992 Barcelona Olympics Closing Ceremony, José Carreras, the famed Spanish tenor, sang _Amigos Para Siempre_ with Britain’s classical cross-over lyric soprano Sarah Brightman. Brightman would also sing at another Olympics, performing You and Me with Chinese tenor Liu Huan at the Beijing Opening Ceremony in 2008. Dr. Seuss – American shooter Theodore Geisel competed in two shooting events, both variants of free rifle at 200 metres, at the 1900 Paris Exhibition. The events are not considered Olympic events at this time, but would be considered demonstration events. Geisel’s grandson, Theodor Seuss Geisel, later became much better known under his nom-de-plume of Dr. Seuss, popular author of children’s books. Charlotte Rampling – Charlotte Rampling is a well-known actress, appearing on over 100 films in the United States, Great Britain, Italy, and France. She was the daughter of Godfrey Rampling, who won two medals with British 4×400 metre relay teams – a silver in 1932 and a gold in 1936. Swoosie Kurtz – An American actress, Swoosie Kurtz has won one Emmy Award (American television) and two Tony Awards (Broadway). Her father was Frank Kurtz, bronze medalist in platform diving at the 1932 Los Angeles Olympics. Frank Kurtz later became a highly decorated military pilot, having received the Croix de Guerre, 3 Silver Stars, 3 Distinguished Flying Crosses, 3 Air Medals, and 5 Presidential Citations for his aviation heroics. During World War II he piloted the Boeing B17-D Flying Fortress bomber, which was nicknamed “The Swoose” because it resembled a half-swan, half-goose. The Swoose is the source of the unusual name for his daughter, as Swoosie is her real given name. Sir Arthur Conan Doyle – Conan Doyle was on-hand to watch the 1908 Olympic Marathon, having been asked to write a story about it for The Daily Mail. His story on the Dorando Pietri tragic ending appeared in that newspaper on the next day. He also started a financial fund which was given to Pietri, violating all contemporary amateur rules. 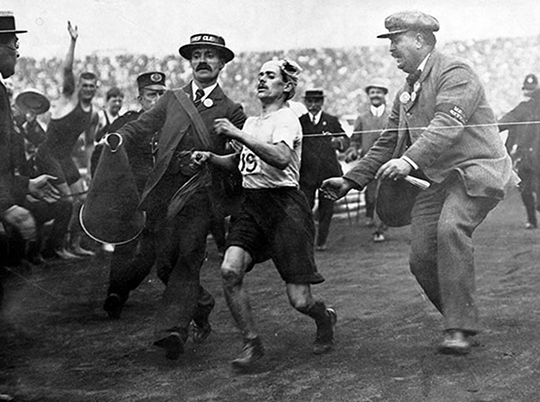 Conan Doyle is often considered to have been one of the officials assisting Pietri across the line in the famous photo seen below, but that is incorrect, as those two officials were Jack Andrew, the Clerk of Course, and Dr. Michael Bulger, the Chief Medical Officer. James Foulis – Jim Foulis was a Scottish golf professional who won the 2nd US Open ever played, in 1896. His Olympic connection came because, after moving to the United States, and settling in the midwest, he became a well-known golf course architect, and designed the Glen Echo Country Club course, the site of the 1904 Olympic golf tournament, the last time golf was contested at the Olympics. Walt Disney – known for Disney World, Disneyland, multiple movie and television productions, Walt Disney was also the man responsible for choreographing the Opening Ceremony of the 1960 Squaw Valley Winter Olympics. Davis Cup – The Davis Cup was donated by Dwight Filley Davis as an international team tennis trophy in 1900, while Davis was still a student at Harvard. Dwight Davis later played in the 1904 Olympic tennis tournament, reaching the round of 16 in singles, and the quarter-finals in doubles. Davis would enter politics and serve as the United States’ 49th Secretary of War (later called Secretary of Defense) from 1925-29. Wightman Cup – The Wightman Cup was an international team tennis trophy for women, which was contested between the United States and Great Britain from 1923-89. The trophy was donated by US tennis star Hazel Wightman, who won the US singles title four times from 1909-19, including three times in a row (1909-11). Wightman played in the Olympic tennis tournament in 1924, winning gold medals in both ladies’ doubles and mixed doubles. Bobby Orr, Sophia Loren, John Glenn, Stephen Spielberg, Lech Wałeşa, Desmond Tutu – all of the above, famous in multiple fields, helped carry in the Olympic Flag at the Opening Ceremony of various Olympic Winter Games. Orr, considered by many the greatest ever ice hockey player, carried the Olympic Flag at Vancouver in 2010. Legendary actress Sophia Loren was an Olympic Flagbearer at Torino in 2006. John Glenn was the first American astronaut to orbit the Earth, and was later a US Senator for many years. Stephen Spielberg is a movie director who has directed some of the most popular movies ever made, including Jaws, Schindler’s List, Saving Private Ryan, and ET – the Extra-Terrestrial. Wałeşa and Tutu were were awarded the Nobel Peace Prize in 1993 and 1994 respectively, Wałeşa for his role in Solidarność, and his role in helping Poland break free from Soviet control; while Tutu was a South African bishop responsible for helping the break-up of apartheid in that nation. The last 4 all carried the Olympic Flag at Salt Lake City in 2002.